We make no charge for kiln dried logs Faringdon deliveries from our yard nearby in Goosey. Our hardwood logs are primarily Ash and Beech and are dried in a kiln which is fuelled by waste wood from the yard. Because they are then barn stored, they maintain a very lmoistureure content of between 10 – 15%. We deliver daily to Faringdon and the surrounding villages including Watchfield, Coxwell, Shrivenham, Uffington and Longcott. See our map for more details, but if you think you are just outside the area, please give us a call. Our delivery charges are competitive and we may be already delivering close to your location. 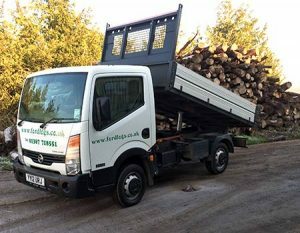 We deliver our logs with a small truck, promptly and reliably at a time agreed with you. We deliver yo the Faringdon area almost daily. Our firewood is delivered loose and we can offer a stacking service from £15. We also construct and supply custom made log stores to help keep your firewood in top condition for burning all winter. Kiln Dried Logs now in stock for immediate delivery to Faringdon. ORDER NOW!